In this practice test you will be required to answer all 18 questions about traffic lights from the Driver Knowledge Test Question Bank. You are facing traffic lights (as shown). What do they mean? You may proceed only in the direction of the green arrow. You may proceed only in the direction of the green arrow when the red light has changed to green. You must give way to oncoming traffic. 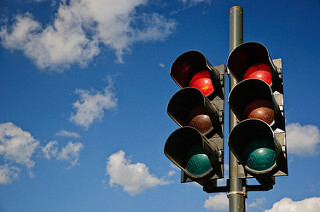 At traffic lights what is meant when a red light appears? Stop, wait behind the stop line until the lights change to green. Stop, wait behind the stop line until the lights change to yellow. Stop, make sure there is no traffic, then drive straight ahead. What should you do when approaching traffic lights which change from green to yellow? Stop at the stop line unless you are so close that sudden or sharp braking might cause an accident. Speed up to clear the intersection before the lights change to red. Stop, only if a red light camera is in use. 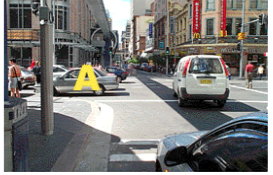 What may you do at an intersection with traffic lights at which this sign is displayed? If the lights are red you must first stop, then you may turn left if it is safe to do so. You should slow down and check if anyone is coming before turning left. You may turn left only if a green arrow is shown. Are you permitted to make a U-Turn at traffic lights? No, unless there is a U-TURN PERMITTED sign at the intersection. Yes, if there is no danger of colliding with another vehicle. Can turn left, but not go straight ahead. Can turn left or go straight ahead. Can turn left only if a sign 'TURN LEFT AT ANY TIME WITH CARE' is displayed. Can go straight ahead, or turn left or turn right, if it is safe to do so. Must stop and wait for the red light before proceeding. Can make a U turn provided it is safe to do so. Not turn right while the arrow is red. Turn right when you have waited one minute. Turn right if it is safe to do so. Stop and wait for the green light. Speed up to avoid traffic from the left and right. Sound your horn and proceed through the red light. Stop and turn left only if it is safe. Slow down and turn left or right if it is safe. It is early morning and there is no other traffic about. You approach an intersection when the traffic lights change from green to yellow. What should you do? Check both sides of the intersection and then proceed. Wait until the traffic behind you makes you move. Stay behind the stop line until the green arrow shows. Enter the intersection and wait for the green arrow. Stop, then if you see it is safe turn left. Stop until the light turns green. Stop then go straight ahead. You wish to turn left at this intersection and the traffic lights are green. What should you do? Wait behind the stop line until there is room for you to enter the new road. Move forward slowly, make the left turn and wait behind car A. Enter the intersection and sound the horn. Stop before the lights, unless you are so close that sudden braking might cause an accident. Drive through the intersection without accelerating. Accelerate to clear the intersection before the lights change to red. Apply to road works vehicles only. 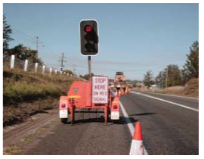 Are installed to warn motorists of construction works. Where do you stop at temporary traffic lights? At the ‘Stop here on red signal’ sign. After the traffic lights, but before the construction zone.